to deepen your yoga practice. *Contact us if you have 6 or more participants. *Packages are also available upon request. 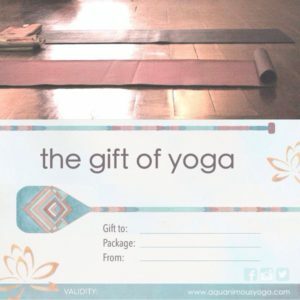 Purchase these Private Classes as a Gift Card at our studio or buy an eGift to print or e-mail. Kindly indicate this upon purchase so we can either give this beautiful gift card to you or e-mail it to your loved one. They will just have to present it to us on their first day of class to complete their registration.